The Intertwine Alliance builds on the actions of previous initiatives to conserve and protect the natural areas and resources within our metropolitan region. This region’s citizens have stood up numerous times to protect and invest in natural areas in the communities where we live. 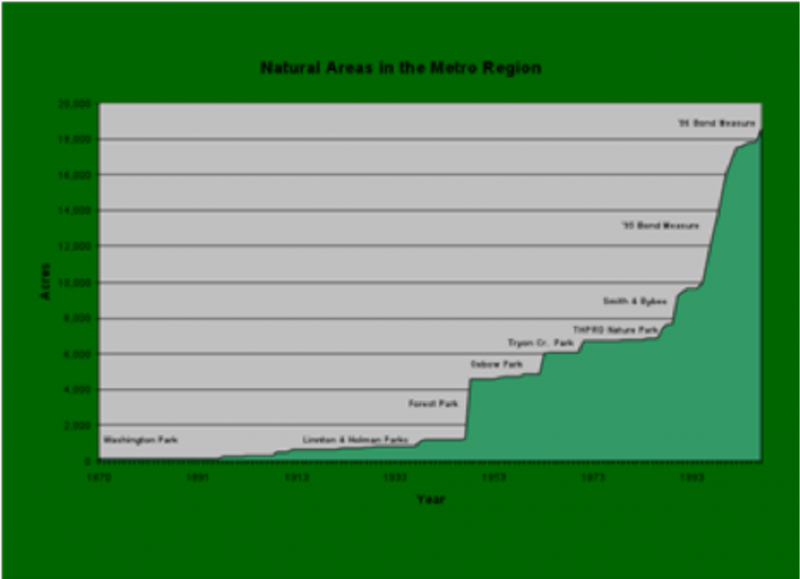 The combination of innovative policies (such as Clark County’s Conservation Futures Act) and political leadership (such as Metro’s successful bond levies) have directly led to increased natural areas in our region. Land Trusts and advocacy groups have played an important role in advocating for region-wide land stewardship. The practice of applying intelligent land stewardship principles in the Portland-Vancouver metropolitan region is the product of many visionary leaders and organizations advocating for the importance of a regional network of parks, trails, and natural areas. The initiative to coordinate the region’s green infrastructure is afforded by years of smart planning that has resulted in better protection for the region's natural resources and the addition of thousands of acres of parks and natural areas. As this overview will show, the region can point to the clear social, economic and ecological benefits accrued by these investments - achieved through voter-approved bond measures and land trusts We can anticipate similar benefits from future investments in our regional system. It is not an accident that thousands of acres of protected natural areas and parks exist within our region. Between Metro’s 1995 and 2006 Bond Measures alone, 15,000 acres have been purchased and preserved by a government agency that, as recently as twenty years ago, was not primarily concerned with conservation initiatives. Local jurisdictions have been taking advantage of the funds from Metro’s Bond Measure as well; initiatives taking place in Hillsboro’s Jackson Bottom Wetland, East Metro’s Gresham-Fairview Trail and North Portland’s Baltimore Woods corridor are all directly funded by Metro’s ambitious bond levy six years earlier that funnels resources to local providers. Yet Metro isn’t the only parks provider to successfully make the case to constituents about the importance of open spaces and recreation. Parks providers such as the City of Tigard, Tualatin Hills Park and Recreation, North Clackamas Parks and Recreation, City of Lake Oswego, and Clark County have all taken proposals to the ballot box and been rewarded by the support of citizens in this region who are eager to leave a legacy for future generations. There are Intertwine partners working for conservation and land acquisition outside of the government realms as well. The Trust for Public Land, the Columbia Land Trust and the Nature Conservancy have historically helped conserve property within the region; the Columbia Land Trust, for instance, has partnered with Clark County’s conservation areas acquisition program by providing private dollars on top of public funds, most notably along the East Fork of the Lewis River. The CLT spent over $5.3 million in 2010 alone on land acquisition, and holds over $28.7 million in conserved property, receiving over $4.6 million in grants. These land trusts have also been active in negotiating conservation easements with private property owners, which has successfully helped protect open spaces near large habitats such as Portland’s Forest Park. The Trust for Public Land, one of the early supporters of the Intertwine Alliance and a staunch ally in our regional conservation efforts, has successfully safeguarded 17,000 acres in the Columbia River Gorge through 65 transactions, and has been involved with in facilitating of Metro acquisition of Chehalem Ridge and the expansion of Gresham’s Nadaka Nature Park.